In the eleventh century, the Roman Catholic and Orthodox branches of Christianity separated to follow different interpretations of the Filioque Clause – this was about which parts of the godhead – father, son, holy ghost – proceed from which. They set in motion two antagonistic houses claiming propriety of the true faith. But they weren’t the first to fall out – the Coptic church in Egypt had obstinately gone its own way after the Council of Chalcedon back in 451. Typical. Then, a thousand years later at a bottle share in the White Hart Tap, my turn came around to nominate the next beer. Though I hadn’t brought it, I chose Timothy Taylor 1858 brown ale which stood diminutive amongst about twenty bottles and cans on the table before us. I decided on this ale as we’d been getting through the sours and Bretted beers, semi-deliberately leaving the darker and ever-soaring abv offerings until the end, so the Tim Taylor needed to be dealt with sooner rather than later. As fellow beery folk, you might already see the problem here: being a mild-mannered quaffing ale, it was outgunned in this zythotic arms race. I cracked it open and poured myself a trickle before handing the 330ml bottle to my left to be passed clockwise around the table. We got a cookie dough aroma and some caramelised brown sugar on the palate. To be honest, we might as well have been sampling Nesquik. I don’t know whether I rate 1858 Brown Ale because I’ve only had a tiny slug from a diddy bottle decanted in the wake of the oak-ravaged sourness of Rodenbach Grand Cru, the spiritous dark chocolate of Howling Hops Fighting Ale (11.5%) and Pope’s Yard Bruitish – unhopped Gruit that smacks of wet spring hedgerows and chlorophyll. Once emptied, the bottle was placed on another table taking its position at the far left of a lengthening row because left to right described the order of delectation – the *sinister* being the worst – the *dexter* the best. I felt bad looking at 1858’s low standing in this hierarchy. The problem isn’t that the beer is bad, but simply out of context – it’s in the wrong culture. There’s nothing blasphemous about a traditional brewery bringing out its ales in bottles or cans, it’s just that it doesn’t play to its strengths. Somehow, reducing the bottles down to 330ml makes things doubly anaemic – psychologically, small measures need to punch above their weight. 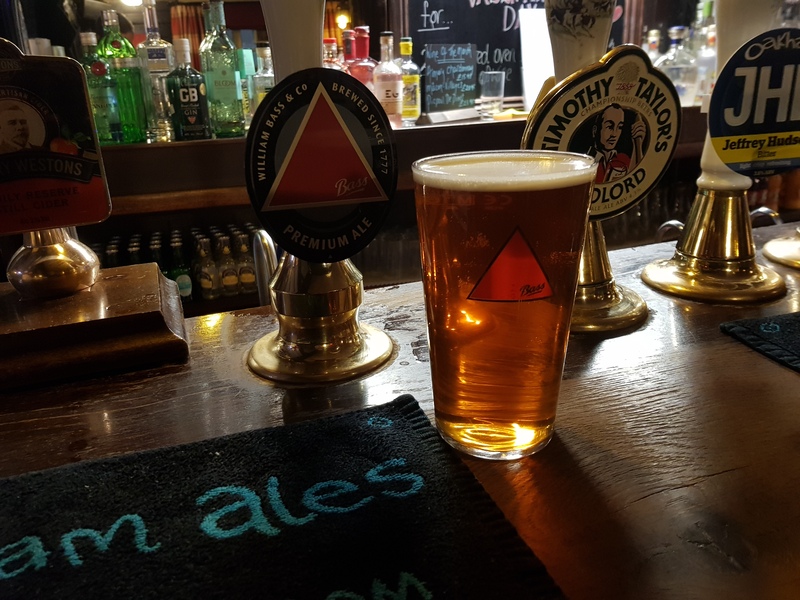 Ironically, a few feet from where we sat was a Timothy Taylor hand pull: Landlord – a mainstay on the pub’s bar that to me – acts as a reliable fall-back if I don’t fancy the guest ales. Cask – that’s 1858’s proper culture. At some point, the sign of the cross became a further antagonism – another way to differentiate yourself from the foreign heathen. Fingers pass left to right (Catholics) and right to left (Orthodox). Wedding ring on the left hand for the west, right hand for the east. There are several pubs in St Albans that have adopted what I’ll unoriginally refer to as craft beer. In this context, I mean keg beer which isn’t a corporate Lager brand. As we all know, this is a lazy epithet which crumbles under scrutiny – but it’s also the widely understood shorthand, and reinforces my point about there being multiple beer cultures in the UK. I know regular pub-goers who will not cross the threshold of pubs like the Craft & Cleaver, Kings Arms or Verulam Arms (all proudly serving craft keg), and who have started viewing other pubs that are bringing it in with ballooning apprehension. One consequence of this is that the clientele in the “craft” pubs end up being younger than the punters in the “cask” pubs – a bewildering phenomenon I think is unique to the UK. At the same time, I’m getting increasingly cosy nursing pints of Sussex Best, Bass, Landlord, Southwold or AK for the times I don’t want to analyse or dissect what I’m drinking, but instead just want to enjoy sinking it. And yes – I’m reading that sentence back with more than a little disbelief. The varied beer cultures seem to speak to different parts of my brain. Until recently, beer bottles in the UK had a poor reputation. The clear glass staples of Fursty Ferret or Bombardier used to be sulphurous on opening. Whether this was a natural bi-product of carbonation or an off-taste of being lightstruck under fluorescent supermarket strip lights I don’t know. In Britain, there isn’t a culture with regards to beer, but a range of cultures, and within these traditions, the respective followers deliberately jimmy at the cracks. Furthermore, beer styles don’t cross naturally from one culture to the other. 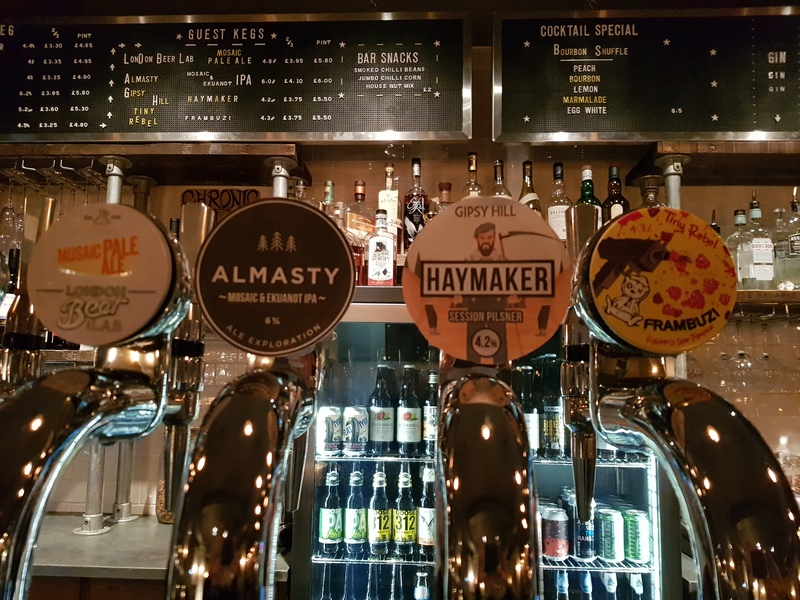 The worlds of craft (the lazy meaning again), bottle and cask continue to scissor out despite the fact they’re all beer. The drive to set yourself apart from something is for the most part subconscious, but it’s reconfirmed with each outward breath. With craft there is subversion where there was nostalgia, glare in lieu of soft light, angular where once was curvaceous, nakedness where hitherto was cladding. I find that cask never translates to bottle – even with a CAMRA speech bubble stuck on. Bottles eagerly favour the intense – the Brett, triple-hopped, barrel-aged or the sour – but they never seem to capture the essence of cask ale. The cultural schism I started this post on went on to reflect all aspects of life from food to clothing to artwork. For example, Orthodox iconography always has the eyes facing the viewer – even when the face is turned away – this results in some odd Picasso-isms in its tabletry. Even easier to tell apart are the bearded eastern priests from their mainly clean-shaven Catholic counterparts. Does something similar happen with adherent drinkers? Maybe self-determination becomes subliminal tribalism. But for today’s faithful, whether it’s in bottle, keg or cask – it’s still supposed to be the same love, right? I would imagine a bottle share is a rather cringe-inducing opportunity fot everyone to try to demonstrate what superior taste they have. I mean, you wouldn’t bring along ABBA Gold to an album share. Surely 1858 is a relic from the days when every pub had half-pint bottles of brown and pale ale behind the bar, at room temperature. Half the people taking part weren’t familiar with sours or lambics so it was a new experience. 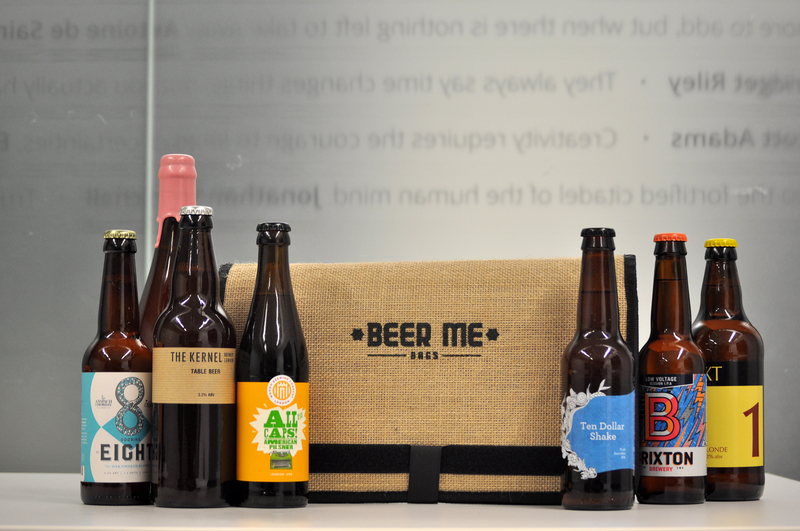 One man is a real enthusiast with background knowledge of the beers bought in (even not by him). I showed a picture of the foudres at Rodenbach’s brewery on my phone to some “oooohs”. Another member was the pub landlord who initiated these shares. Overall, it wasn’t geeks competing around a table – just curious people. The 1858 is a take on the American style of brown ale. But if you’re in a Tim Taylor pub, it would be worth seeing if they do stock them behind the bar as you suggest.